Editor’s note: To submit a nonprofit announcement to The Sentinel’s Religion section, contact Julianne Cahill at 248-6741 or by email at jcahill@lewistownsentinel. com. Items also may be faxed to 248-3481 or sent to The Sentinel, 352 Sixth Street, Lewistown, PA 17044. Items should arrive to The Sentinel by Wednesday afternoon for publication in the Saturday edition. Submissions will be published as space allows. The editor reserves the right to edit all submissions. MIFFLINTOWN — A free evening of worship with local musicians, fellowship, desserts and coffee will be held at 6:30 p.m. today at the Life Center of Cedar Grove Brethren in Christ Church. This event serves as a fundraiser for 2018 mission trips to Haiti. McVEYTOWN — McVeytown United Methodist Church will have a worship service at 6:30 p.m. and family movie night at 7:30 p.m., today at the church. The movie will be an animated family movie. Snacks provided. LEWISTOWN — “Faith for Family” seminar, a family enrichment series, began Friday, at Seminar Auditorium, 1020 W. Fifth St., Lewistown. Robert Snyder is the speaker. ¯The Bible’s Most Important Prophecy, 7 p.m., Friday. Free admission and study guides for participants. To register, call (717) 436-2991 or visit AttendHope.com/Lewistown. LEWISTOWN — Rhodes Memorial United Methodist Church will host Homecoming at 10:45 a.m. Sunday at the church, 500 Highland Ave., Lewistown. The theme is “What are you wearing?” Guests are invited to wear an article of clothing or outfit that represents one of the fruits of the Spirit: love, joy, peace, patience, kindness, generosity, faithfulness, gentleness or self-control. The service will include special musical guest KJ Reimensnyder-Wagner. At noon, there will be a covered dish meal. McVEYTOWN — McVeytown United Methodist Church will hold a prayer vigil from 3:30 to 6:30 p.m. Wednesday. The church will be open for anyone wanting to pray in the sanctuary. There will be guided material available with focus topics, however independent prayer is encouraged. Prayer takes many forms; all are welcome. MILLERSTOWN — Revival services will be held at 7:30 p.m. daily, from Oct. 27 to 29, at Mt. Zion United Methodist Church, Dressler Ridge Road, Millerstown. BELLEVILLE — The annual Gator Camp Awareness Dinner at Locust Grove Mennonite Church is set for 6:30 p.m. Oct. 28. The camp is a school for boys ages 10 to 16 years old in southwest Florida. There, boys focus on building relationships, solving problems and learning responsibility. There is no charge for the dinner; an offering will be lifted. Donations go directly to Gator Wilderness Camp School. Make reservations by Sunday. To reserve: Sara Hartzler, (717) 348-4136; Tami Peachey, (717) 437-0871; Larry Yoder, (717) 363-0475; Lou Ann Yoder, (717) 363-0473; Ann Kanagy, (717) 437-4946; or Rose Kauffman, (717) 437-1295. EAST WATERFORD — The Commonwealth Brass Quintet will be in concert at 2 p.m. Oct. 29 at Upper Tuscarora Presbyterian Church, 589 Brick Church Road, East Waterford. A free-will offering will be collected to benefit hurricane recovery. McALISTERVILLE — Missionary Samuel Mohenu will share his story at 6 p.m. Oct. 29 at Stony Run Mission, 2825 Evendale Hill Road, McAlisterville. BURNHAM — There will be a hymn sing from 6 to 7 p.m. Oct. 29, at Windy Hill Bible Church, 22 Windmill Hill, Burnham. Refreshments and fellowship after the event. LEWISTOWN — A Christian unity service commemorating the 500th anniversary of the Reformation will be held at 7 p.m. Oct. 31 at Sacred Heart Church, 106 N. Dorcas St., Lewistown. The service is organized by St. John’s Lutheran and Sacred Heart of Jesus churches. It will emphasize common unity in Jesus Christ, ending with a candlelight ceremony. Both church pastors, the Rev. Jerri Carlin and Rev. William Weary, will preach. Refreshments will be served after the service in the Sacred Heart School Cafeteria. LEWISTOWN — A service of new ministry for the Rev. John T. Harwood is set to be held at 7 p.m. Nov. 1 at St. Mark’s Episcopal Church, Lewistown. The Rt. Rev. Audrey Scanlan, bishop of the Diocese of Central Pennsylvania, will preside. A reception will follow the service. MOUNT UNION — “Celebrating Your Transformation,” a ladies retreat, will be held Nov. 3 to 4 at Grace Community Church, 310 W. Poplar St., Mount Union. The retreat begins with a potluck meal at 5:30 p.m. Nov. 3, followed by a service. The event continues from 8:30 a.m. to 4 p.m. Nov. 4; lunch is provided. There is no cost to attend. Speakers include Jane Bailey and Verna Clemmer, who will talk about changes, choices and consequences. There will be worship and testimonials by community members. More information: Vickie Grove, (814) 599-9314. STATE COLLEGE — The Central Pennsylvania Creation Fellowship is coordinating meetings with Dr. Rob Carter, marine biologist, on Nov. 3 to 5 in State College. Carter is a scientist with Creation Ministries International and will speak on subjects relating to scientific evidences supporting the Biblical account of Creation. ¯ “Coral Reefs and the Flood,” 1-4 p.m., Nov. 3, Oakwood Presbyterian Church, Waddle Road. For Christian school and homeschool students. ¯“What Darwin Didn’t Know,” 9-11 a.m., Nov. 4, Ramada Inn, South Atherton Street. There is a charge for the breakfast, and reservations are required. ¯“The Alternative: Creation’s Competitive Edge,” 10 a.m., Nov. 5, State College Assembly of God, University Drive. ¯“Y-Chromosome Noah,” 7 p.m., Nov. 5, Oakwood Presbyterian Church. To make reservations or for more information, email centralpacreation@gmail.com, or call (814) 880-2578. MIFFLINTOWN — Prophecy Conference, with the theme “The Most High God,” will be held Nov. 4 and 5 at First Baptist Church, along route 35, Mifflintown. A Seder Passover demonstration is set for 6 p.m. Nov. 4. Sunday sessions are scheduled for 8 a.m., 9:15 a.m., 10:30 a.m. and 7 p.m. The featured speaker is Tom Simcox, the northeastern states director for The Friends of Israel Gospel Ministry. BEAVERTOWN — St. Paul’s Reformed Church of Beavertown will hold Fall Rally Day at 10:10 a.m. on Nov. 5. Gospel music will be provided by vocalist Brenda Mishler. A love offering will be taken. After the service, a pot luck dinner will take place in the church’s fellowship room. The church is located at 127 W. Walnut St., Beavertown. More information: (570) 658-7590. 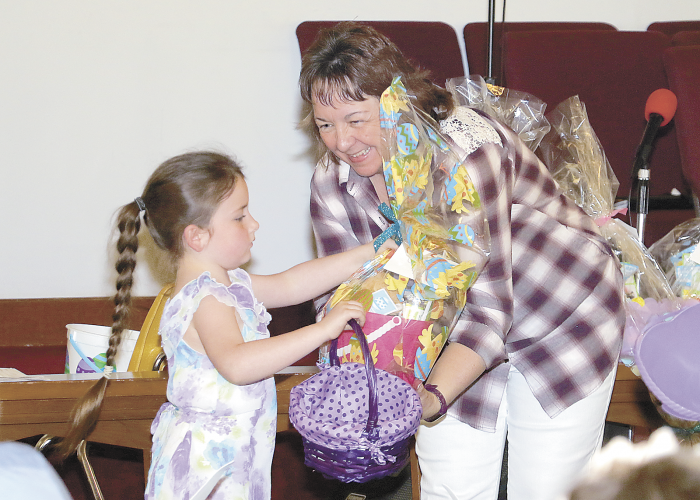 McCLURE — McClure First United Methodist Church hosts Good News Club monthly for elementary school age children. The next meeting is from 4 to 5 p.m. Nov. 9 at the church. Children will be served a turkey dinner with all the trimmings; they are encouraged to bring a friend and parent with them. More information: call Pastor Jim Jacobs, (570) 658-0206. MIFFLINTOWN — First Baptist Church of Juniata County will hold its annual patriotic service at 9:30 a.m. Nov. 12 at the church. The guest speaker will be the Rev. David Kuntz, dually-endorsed chaplain by CBAmerica. He ministers at Nationwide Children’s hospital and is a battalion chaplain in the U.S. Army Reserve in Columbus, Ohio. All veterans will be honored. REEDSVILLE — Reedsville United Methodist Church will host a free movie night, beginning at 6:30 p.m. Nov. 12 at the church. The movie will be “Brother White,” which is about James White, one of a dozen pastors at a megachurch in southern California. He accepts a position at the impoverished Divine Faith Apostolic Church in Atlanta. He and his new congregation must learn to trust each other and come together to save the church from a corrupt banker anxious to foreclose. McALISTERVILLE — Jeremy Goodling Music Ministries will host its annual fall concert at 7 p.m. Nov. 12, at Bunkertown Church of the Brethren, McAlisterville. Goodling has been singing Christian music for more than 25 years throughout central Pennsylvania. This year, he will be joined on stage by gospel group Mended Heart, of Pine Grove. Goodling’s four daughters will also join him on stage for some songs. More information: (717) 463-2063 or www.jeremygoodling.com.